The Gold Coast is famous for its subtropical climate and long sandy beaches, great for walking, swimming, and surfing. But it is also a city in its own right – the second largest one in Queensland, after Brisbane. Famous as a tourist destination for its 40 kilometers of wide sand beaches lined with resorts, it also is a great place to live, with all the amenities, including and airport and hospital. Many of the suburbs have an elaborate system of inland canals and waterways. With a short commute of only 1 to 1 1/2 hours from Brisbane, it is a feasible day trip. But when Micah and Aida visited over Christmas 2016, we decided to stay for several days at Cashelmara, Burleigh Heads, Gold Coast. We really enjoyed our stay there. The beach is right across the road from us and so is a lifeguard station, which is convenient. Although you can swim wherever you would like along the miles of beach, most people prefer the security of lifeguards and will try to say between the flags. We arrive early on our first day and decide to visit the beaches on the furthest south end of the Gold Coast and of Queensland. There is a hill in between Greenmount Beach and Rainbow Bay Beach. Here we look down on both beaches and the vast ocean. Which beach shall we swim at? We decide to swim at Greenmount. As we leave, there is an Aboriginal artist who is painting under the shade of a tree. His paintings are beautiful and we stop to look. Micah and Aida buy a smaller painting while Ed and I get his contact information. Perhaps we will buy a painting at another time. Only Aboriginals can sell paintings in this unique style of dots. It is unique to their culture and so it is a protected industry. The next morning we are out and exploring the Burleigh Heads Beach. It is a cooler and windier morning (very unusual for this time of year), so we walk, collect shells, and enjoy the sites and sounds of the ocean. Surfer’s Paradise is far off in the distance. We are enjoying the relative calm of our area. This seems like a good time to walk through the Burleigh Head National Park, at the headland. Before we begin we stop to watch the surfers. 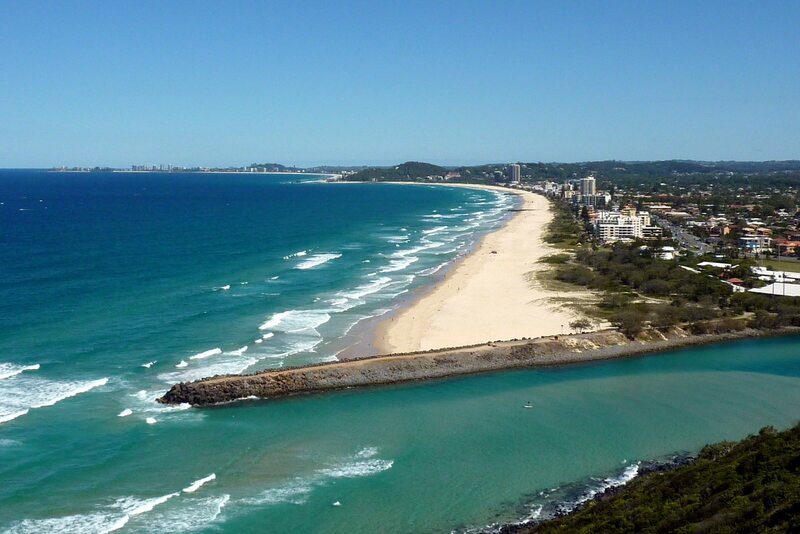 Burleigh Heads is known to be an excellent surfing beach. We are all just chillin’ and watching the surfers. I wander off to take some more pictures and when I return there is Ed, deep in conversation with a new mate (Aussie speak for friend). This seems to be an invitation for a greater gathering and pretty soon the men were socializing. Ed seemed to be oblivious to the fact that we were ready to go and now waiting for him. The Burleigh Head National Park is an interesting place because it is a forest in between beaches. Here is a little of what we saw. Tallebudgera Creek is over the other side. When we arrive there I am thankful that I have worn my swimsuit and I take a nice swim. Side story: The weekend after Micah and Aida return to Germany, Ed and I decide to return to Tallebudgera. There have been reports of Blue Bottle Jellyfish being washed in along the coastline and so we reason that it is safer to swim in this inlet, out of the main current. We had a great time and spent many hours in the water. When we get back home later that day, we hear on the news that (not too long after we left) they had to clear people out of the Tallebudgera due to the presence of sharks. Then it is confirmed to us by several people that they would never swim in the Tallebudgera because of the threat of the aggressive Bull Shark. I’m so glad that we had our swim, because I won’t be swimming there again! Well, this post has gone on long enough. 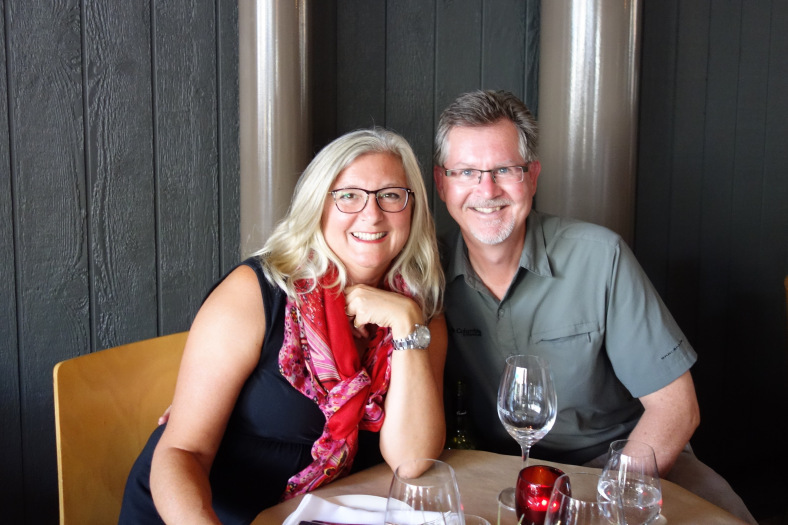 For our final post commemorating Micah and Aida’s visit, we are going to Stradbroke Island – easily our most favorite place to go – and, in my opinion, the most beautiful. See you soon! Also look for another post on the Gold Coast. This will commemorate 4 years of visits to this beautiful area. This entry was posted in Gold Coast and tagged Aboriginal art, beach, Burleigh Head National Park, Burleigh Heads, Gold Coast, Greenmount Beach, Rainbow Bay Beach, Tallebudgera Creek. Bookmark the permalink. ← Hold a Koala. Pet a Kangaroo. Thanks, Rick – and thanks for visiting.